The 2014-15 Buffalo County Youth Advisory Board with Speaker Galen Hadley after their legislative session. 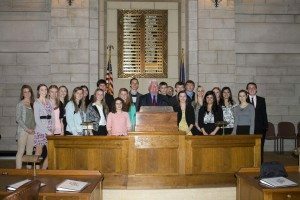 On March 17th, YAB took a trip to Lincoln to visit the Capitol, observe a ligeslative session, listen to Speaker Galen Hadley and Governor Pete Ricketts, and much, much more! To start the day off, half of the group met with the Nebraska Children and Families Foundation, and the other half met with the Department of Agriculture. 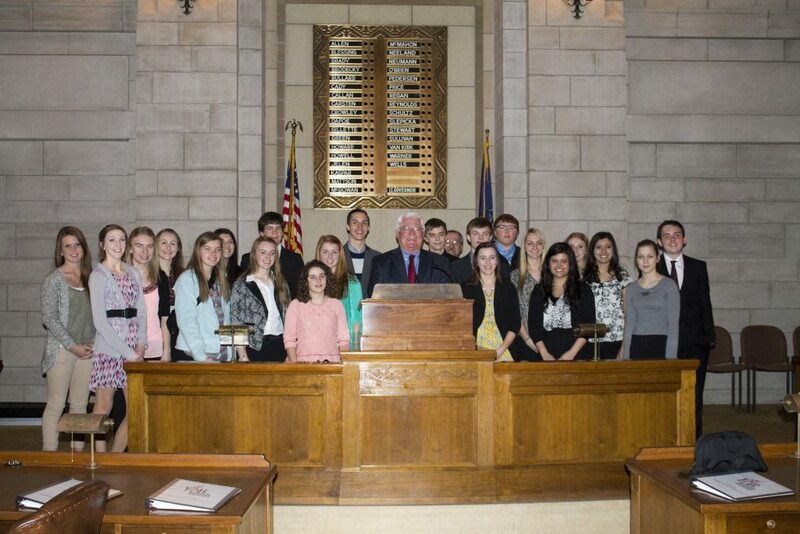 They then went to the Capitol and were recognized by the State Legislature. Next, they conducted youth hearings to discuss marijuana legalization and the safety and welfare of lesbian, gay, bisexual, and transgender (LGBT) students in Nebraska. They heard from Senators Adam Morfeld of Lincoln and Matt Williams of Gothenburg, as well as Nebraska Assistant Attorney General Corey O’Brien, Tyler Richard from the Nebraska ACLU, and Drew Heckman from the Nebraska Human Rights Campaign. After lunch, the group met at the Nebraska Appleseed office to learn about the organization’s work with the Nebraska Legislature and processes for youth to effectively advocate to state senators. The group then met in the Warner Legislative Chamber for a special meeting of the Youth Advisory Board. The meeting started off with remarks from the Speaker of the Legislature and Kearney Senator Galen Hadley. A resolution was adopted to create an anti-bullying task force to improve community awareness for bullying prevention. YAB voted to increase their involvement in drug and alcohol prevention projects, promote awareness of the harms of e-cigarettes, encourage school districts to create “safe spaces” for LGBT youth in Buffalo County schools, and promote programming that discourages distractive driving. The group also voted to recognize six community members as “Positive Adult Mentors,” as well as thank Dr. Diane Duffin for working with the Youth Advisory Board to improve youth involvement in democracy. Governor Pete Ricketts then spoke to the group, discussing the importance of keeping young students in the state, lowering taxes, and helping businesses to succeed. The group then took a tour of the Capital building before heading home. Check out bcyab.org for more information on YAB and the work they’re doing!